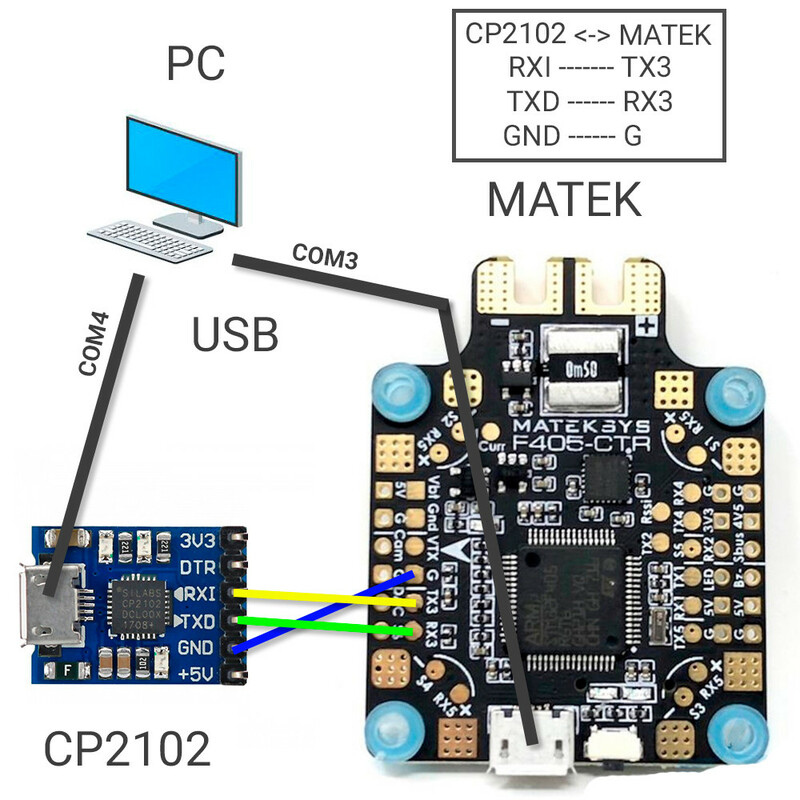 I want to get telemetry data from my flight controller (Matek F405-CTR) and send control commands to it via MSP protocol. I've already configured UART3 port on Matek in Inav configurator (look at pic). But when I'am trying to run simple test from pyMultiWii lib I get nothing from Matek controller neither from CP2102. I've tried this test for COM3 and COM4 ports as well. """show-attitude.py: Script to ask the MultiWii Board attitude and print it.""" May be I'am doing something wrong? I've already read this post, but it dosn't help me. Any advice will be appreciated! Not exactly an answer, but I am unable to post a comment here. Firstly, verify your baud rates (for Windows, make sure you have set the right baud rate in your device manager/properties window as well). Try using the MultiWiiConf, which is a GUI to monitor your flight data and check if it is able to establish communication with your flight controller board. Coming back to your code, what happens when you try to retrieve the MSP_IDENT frame as mentioned here? I have written an alternate simple script here for Python, use the requestFrame method with the frame ID and see if it helps. EDIT: It looks like the pyMultiWii library you are currently using supports only MSPv1. If your board uses MSPv2, the protocol is slightly different as in the link you have already posted in the question. You can use my library as refernece mentioned above to make changes as per MSPv2 protocol and give it a try. Not the answer you're looking for? Browse other questions tagged quadcopter python serial communication multi-rotor or ask your own question. Any image transfer protocol for wireless serial transfer? Is it possible to record only incoming data with realterm?